Golden Gala marks five decades of supporting young generations to win life-transforming opportunities to achieve their dreams. 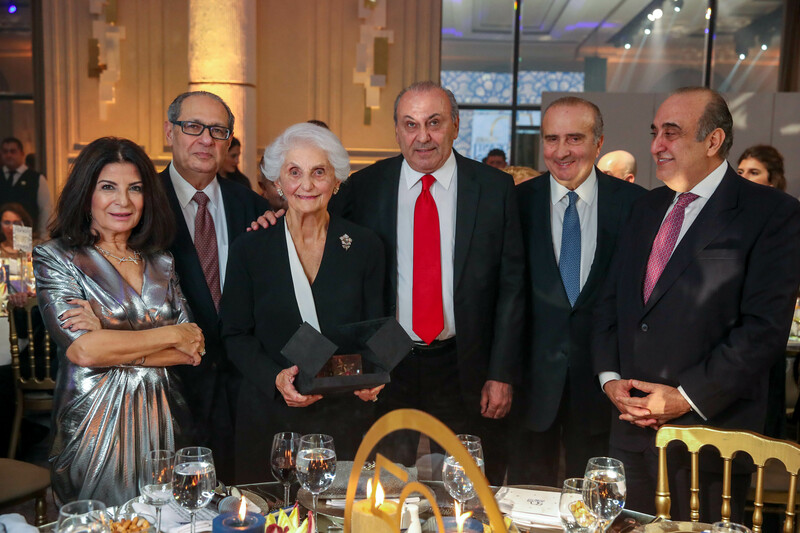 With over 500 friends and supporters in attendance, AMIDEAST celebrated the achievements of its five decades of service in Lebanon at a Golden Gala on November 29 at the Seaside Pavilion on Beirut’s New Waterfront. The significant funds raised at the event will enable AMIDEAST to expand initiatives benefiting youth in Lebanon. AMIDEAST is grateful to individual donors as well as the corporate sponsors of the event: SMLC – Pepsi, INDEVCO, District S, IMP Corporation, Choueiri Group in the President Patron Category; MenaRe Life Insurance as a Provost Patron; Tinol, Dar, LibanK, and Bank of Beirut as Dean Patrons; and La Donna Spa in the Professor Category. A high point of the gala was the presentation of AMIDEAST’s second Annual Education Hero Award. This year’s award recognized Leila Charles Saad, cofounder and chair of SABIS®, for her contributions to education in Lebanon. As the head of a global education network based in Lebanon that spans five continents and educates more than 70,000 students in the private and public sectors across the globe, Saad is widely considered to be one of the most inspiring and renowned educators in Lebanon. Ably led by Country Director Barbara Batlouni for the last 20 years, AMIDEAST has maintained a continuous presence in Lebanon since opening its first office in the country in 1968. It has provided youth from all regions of the country with a broad range of valuable educational, testing, training, and development services, even during the dark days of Lebanon’s civil war, when it redoubled its efforts to provide advising and testing to thousands of young Lebanese seeking a lifeline to educational opportunity in the United States and elsewhere. Following the war’s end, AMIDEAST continued its commitment to Lebanon, diversifying and expanding its services in the process. It contributed to the country’s social and economic recovery by working with USAID and other international and regional partners and the Lebanese government to build capacity in the country’s public administration and its civil society, judicial, and education sectors. Its commitment to supporting Lebanon’s development goals endures today through the USAID-funded Qitabi project to strengthen the country’s public schools. AMIDEAST saw its activities grow in other areas, too, as it assisted students with scholarships and exchange programs, trained and supported entrepreneurs, managed and facilitated empowerment programs for women and youth, and provided English language and professional training courses, workshops, and testing services, all while building cross-cultural understanding. Each year, these services touch the lives of more than 33,000 people from all communities in all regions of Lebanon, regardless of their age, religion, financial status, or gender. They include 113 students who have, with AMIDEAST’s help, won over $20 million in scholarships and financial aid at prestigious universities in the United States, including Harvard, MIT, Georgetown, Columbia, Cornell, Vanderbilt, and the University of Pennsylvania. The proceeds from this 50th anniversary Golden Gala will help support even more young people in Lebanon to win life-transforming opportunities to achieve their dreams. While celebrating the legacy of its first 50 years in Lebanon, the gala was an occasion to reaffirm AMIDEAST’s commitment to the country. AMIDEAST received a significant boost in 2010, with the launch of the ALAB, which has played a vital role in enabling the organization to expand its outreach and impact nationally. The contributions and support of the 24 board members have allowed students to benefit from AMIDEAST’s Diana Kamal Scholarship Search Fund (DKSSF) and Hope Fund programs, entrepreneurship training, professional development for English teachers, and employability skills training for women and youth.